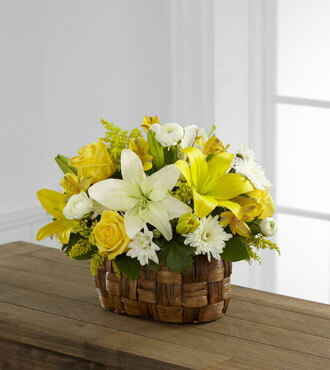 The FTD® Nature's Bounty™ Basket bursts with the beauty of floral brilliance. Yellow roses, Peruvian lilies, solidago and LA Hybrid lilies are arranged amongst white ranunculus, chrysanthemums and LA Hybrid lilies accented with lush greens for an eye-catching look. Presented in an oval banana leaf woven basket, this sunlit arrangement will warm your special recipient's heart with its blooming perfection. GREAT arrangement includes 13 stems. Approx. 12"H x 16"W. GREATER arrangement includes 19 stems. Approx. 13"H x 18"W. GREATEST arrangement includes 24 stems. Approx. 14"H x 19"W.